Don't like my combination?? Well then make your own gift set! Just choose which 4 you would prefer and write them in the notes at checkout, Easy! Now I want to share with you some of my tasty ideas and I must admit, I am having a really fun time trying these with family and friends or just for my husband and me. Somehow eating popcorn and watching a movie at home is so much more comfortable and surely cheaper! Enjoy! Recipe: Melt 1-4 TB of butter: Add 1- 3 teaspoons of spice blend and sugar. Salt to taste and toss. KFC Popcorn -Paprika, onion, celery seed, sage, garlic, allspice, oregano, black pepper, basil, marjoram, nutmeg, tomato. Recipe: Melt 1- 4 TB of butter: Add 1- 3 teaspoons of spice blend, salt to taste and toss. Try adding 1 C toasted coconut and 2 tsp grated lime or Lime Tostitos! Try adding Spicy Cajun Toasted Corn! Herb Toss Popcorn-Basil, chives, parsley, dill weed, garlic, lovage, black pepper, savory and thyme. Barbecue Popcorn-Cumin, chili powder, paprika, garlic. Try adding crushed BBQ potato chips & a pinch of cayenne! Recipe: Melt 1-4 TB of butter: Add 1- 3 teaspoons of spice blend and brown sugar. Salt to taste and toss. 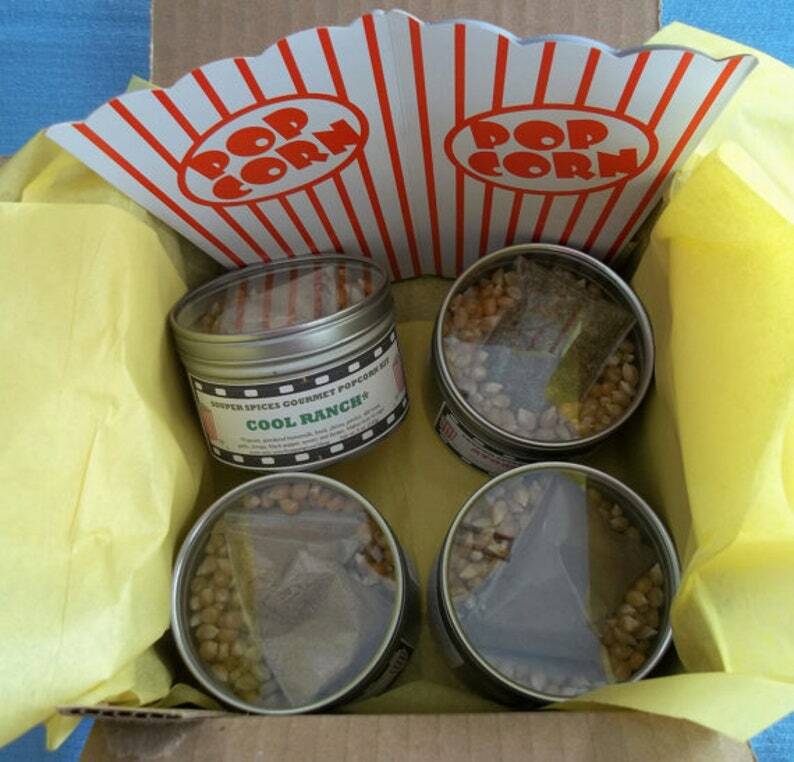 Seafood Boil Popcorn-Allspice, ginger, bay leaves, celery seed, paprika, dry mustard, black, white & cayenne pepper, nutmeg, cloves, paprika. Recipe: Melt 1-4 TB of butter: Add 1- 3 teaspoons of spice blend. Salt to taste and toss. Try adding prawn chips or oyster crackers! Sweet 'N Spicy Popcorn- Cinnamon, ginger, cayenne. Recipe: Melt 1-4 TB of butter: Add 1- 3 teaspoons of spice blend. Add confectioners' sugar to taste. Try adding crushed tortilla chips! Try adding crushed Oreo's or mini marshmallows! Try adding dehydrated apple slices! Add the oil and 3-4 kernels to a medium sauce pot and if you are making a large batch use a larger pot. Place the lid on top and turn the heat onto high and wait for the kernels to pop. Once the kernels have popped, add the rest of the kernels, replace the lid, and give the pot a swirl to coat the kernels in t Once the kernels begin to pop rapidly, crack the lid a little bit to allow excess steam to escape. Make he hot oil. Wait for the kernels to begin to pop. You can swirl again to redistribute the hot oil, if needed.sure it's only open a little to avoid popcorn projectiles. When the popping slows to a few seconds between pops, turn off the heat. Wait a couple of seconds for the last few pops, then remove the lid and season the popcorn.